Fight Spiritual and Social Poverty in Sweden! Research released by World Values Survey (WVS) confirm Göran Skytte’s thesis about the real state of the Swedish citizen in regards to spiritual (and I may add, social) poverty. 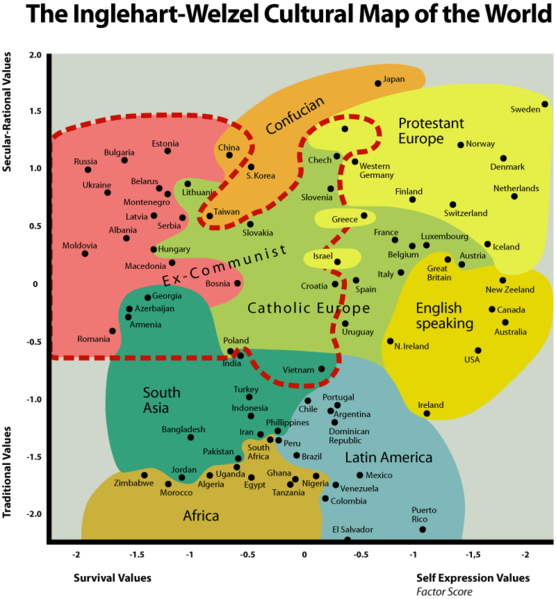 The results of the research as measured by WVS by grading on axes in the picture below show that we are the most secular and most individualized nation in the world. For some that might be considered a great exploit and shows how we are in control, for me it only shows how far we have fallen from our intended life. (For more information on World Values click here and here). We are social and spiritual beings with a need for true community and with a need for purpose and destiny. The assumption that we don’t need anybody and the exalted view on the celebration of independency as if it was a merit only shows our true poverty as we stick our heads into the sand ignoring the reality of life. The sticking of heads into the sand can be a great way to conceal the tears we are crying as no one knows what is happening down under the surface in the sand. However, it takes a strong person to shed those same tears publically and to admit the need for others and God in ones life. Per Gudmundson in today’s leader in Svenska Dagbladet stated it clearly: “About some things you just don’t talk” with as sub title: “the Swedish sin”. Anyway, the fact is that talking about money and income is literally a taboo in Sweden, even yesterday as I was meeting with a group of sixteen people (from 9 nations, including 5 Swedes) who are considering to become members of our church we spoke about their right as members to ask any questions about the economy in our church. They have the right to know exactly how much I earn and, for that sake, also about the other employees in the church. The fact is that I have never ever heard a member ask that question to our board… Why? Because it is a taboo! I believe deeply in accountability and believe therefore also that if we are serious about our responsibility that we need to practice accountability in this area as well. How can members in a church take responsibility without knowing (asking)? I believe in openness and transparency also in those matters and I believe that we as Christians have an even greater responsibility to live lives in transparency, not only for the sake of our legal and tax system. I believe that we are to fight the spirit of Mammon and consumerism to be able to be a Church which is trust-worthy! The problem so well articulated in the article which I mentioned comes down to: It’s never enough! The problem of consumerism as a lifestyle means that we must keep raising the stakes and the investments. Enough is never enough, and soon we are possessed by our possessions. Shopping is the number one cultural activity in our country. Accumulation of unnecessary goods has become a habit, even an addiction, as we wring our hands over lack of storage space. What we once considered luxuries we come to regard as necessities, and eventually we become dependent upon the things we acquire. Consumerism as a way of life demands competition, workaholism, and individualism. What to say more about these things? You know, I came together with my wife as missionaries to this nation and were being financially supported by our friends to be able to do our work here. I remember the day that I, from having worked as a volunteer (no employement), to becoming employed by the church which my wife and I and fifteen others had started. My first salary was an reason of thanksgiving. Why did I thank God? Believe it or not, I thanked Him that from then on I was able to pay taxes and start supporting this society which I had learned to love and appreciate so much also financially! (To avoid any misunderstandings; I was NOT impressed by our social welfare system, but by you, the Swedish citizens! – and therefore I wanted to be part by paying taxes). Maybe this is another approach to the matter… what do YOU think? How do you look at life, lifestyle, money and spending?